The Write Taste Tipples of the Month 2012. Now that the weather’s turned and chilly days and nights beckon, it’s time for a warming tipple to keep the cold at bay and ward off the impending winter blues. Porter is a traditional London drink from the 18th Century, but can be found in many countries around the world, including Finland and the USA. Fuller’s is a historic London brewery that can trace its origins back to the time of Oliver Cromwell. 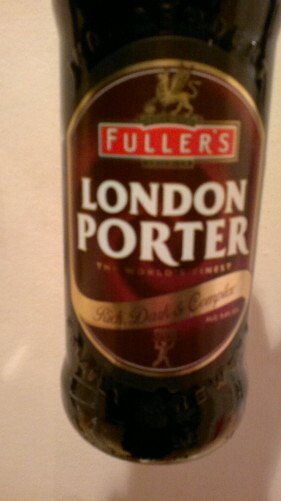 Their London Porter has won numerous awards for its rich complexity of flavours due to the blend of brown, crystal and chocolate malts with traditional Fuggles hops. The dark brown colour suggests a rich nose and flavour profile and there is no disappointment here. Aromas of chocolate with hints of coffee and roasted, smokey malts lead on to a palate of upfront treacle, followed by a malty chocolate finish. This is not a light beer, on the contrary, one to be savoured or partnered with rich meat dishes or desserts like Christmas or chocolate pudding. Enjoy a taste of tradition!